November 15, 2016 (Lincolnshire, IL) – Klein Tools, for professionals since 1857, today announced new results from its third-annual 'State of the Industry' survey. More than 400 union and non-union electricians were surveyed and shared their concerns about the future of the industry. Major concerns include the growing skills gap and the availability of jobs in the next five to 10 years. As a company that focuses on providing the necessary tools and programs needed for electricians to do their jobs, Klein Tools was interested in learning electricians' concerns so it could better address these issues. 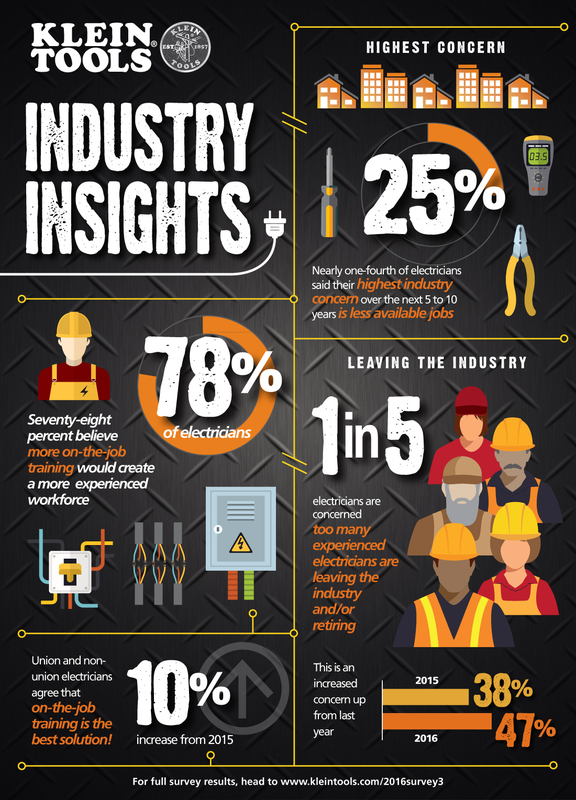 The Klein Tools' State of the Industry survey found the biggest industry concerns from electricians are that too many experienced electricians are leaving the industry and/or retiring and that there will be less available jobs in the next five to 10 years. "We're finding that many electricians have concerns about the future of the industry in the next five to 10 years," said Mark Klein, president of Klein Tools. "Many electricians see the number of experienced electricians leaving the industry and are concerned that not enough young electricians and apprentices are joining the field to replace them. A large number of electricians are also concerned with the amount of jobs that will be available in the next five to 10 years. With more high-tech installations, including smart homes and the dependency on high-tech electronics, the industry is experiencing dynamic change. Klein Tools is committed to ensuring electricians are ready to adapt to this changing environment." Consistent with the general industry concerns, the Klein Tools' State of the Industry survey found electricians believe there is a current shortage of experienced electricians in the field. However, many electricians indicated that more on-the-job training would create more experienced electricians and resolve this shortage. "The shortage of experienced electricians is a concern for the majority of electricians surveyed, and many have the same ideas for how to resolve this issue," said Mark Klein, president of Klein Tools. "Many believe on-the-job training is the best solution to gaining more experienced electricians in the workforce. This is compared to continuing education, more classroom-based training and more or better online training. Klein Tools is working with its partners to ensure that young electricians and apprentices are receiving more on-the-job training to guarantee the shortage of experienced electricians is resolved." 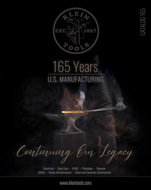 The Klein Tools 'State of the Industry' survey was conducted by Russell Research, an independent survey research firm, which conducted 201 online interviews from January 20 – 26, 2015, and 200 online interviews from January 27 – February 5, 2016, to secure a nationally significant representation. Forty percent of respondents were union members and 60 percent were not.